But, Tuesday! Tuesday is a happy day. 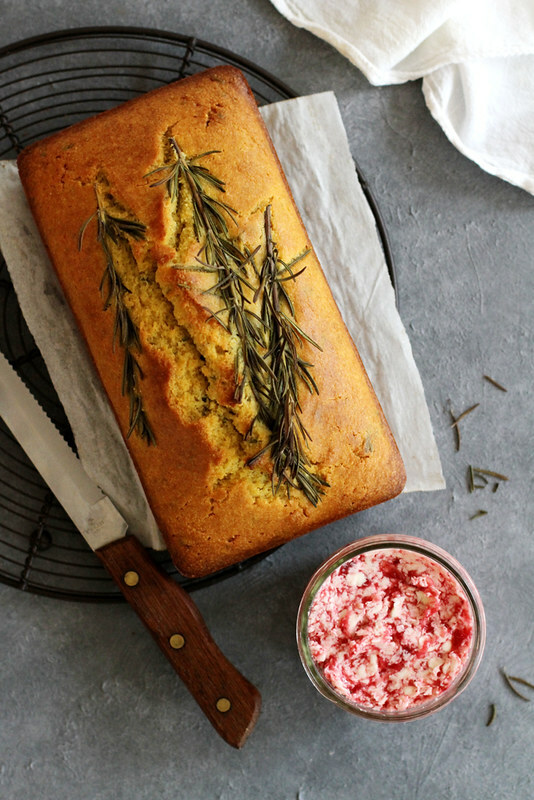 Tuesday means Christmas is one day sooner than it was yesterday (unless that freaks you out because you have purchased exactly zero presents for people, in which case, maybe head over to Amazon after reading this post), Tuesday means it’s one day closer to the weekend, Tuesday means I’m a little more awake and therefore able to legitimately share this rosemary cornmeal loaf recipe with you. With lingonberry butter. Hold me. Another reason for the delay in posting is that this quick bread was not my original intended recipe to share. I had grand plans to show you a baked brie recipe topped with lingonberry jam and wrapped in a rosemary brioche, and all was going really well until… well, until I baked it. And the end result was a blob of cheese, oozy jam and underbaked brioche. Blech. Please tell me you’ve been there? Please tell me I’m not the only one to fail on a baked brie recipe, which is otherwise ridiculously easy to make. I just… let’s not even talk about it anymore. Let’s talk more about this victory, this cornmeal loaf speckled with fresh rosemary served with a sweet and tart jam-swirled butter. Yes, that. I love this loaf because a) it’s a quick bread, so not fussy at all, b) the ingredients are simple and v. v. accessible, c) the taste is off-the-charts delicious: perfectly blended with herbal, olive oil and cornmeal flavors in one tender, crumbly loaf. And that sweet, tart, creamy lingonberry jam butter? Fuhgeddaboutit. I’d suggest you package all of this up for a festive holiday gift (because how fun would it be to give a homemade loaf and butter in Christmas colors? ), but if you decide to keep it all for yourself, I won’t tell Santa. So maybe one day that baked brie situation will have its day here, but until then, I’ll happily nibble on buttered slices of this loaf until Christmas morning. Heat oven to 425 degrees F. Grease bottom and sides of 9-by-5-inch loaf pan with butter; line with parchment paper extending up sides of loaf pan (to use as handles when removing loaf). Grease parchment paper. In large bowl, whisk flour, cornmeal, baking powder, baking soda and salt. Stir in chopped rosemary. In separate large bowl, whisk eggs, sugar, buttermilk and oil until combined. Add dry ingredients; stir until just combined. Spread batter evenly in prepared pan. Top with 3 sprigs fresh rosemary, if desired. Bake 40 to 45 minutes until toothpick inserted in center comes out clean. Cool completely in loaf pan. Meanwhile, in bowl of stand mixer, beat softened butter and lingonberry jam until well combined. Serve with fully cooled, sliced loaf (NOTE: remove rosemary sprigs before slicing). This is beautiful! 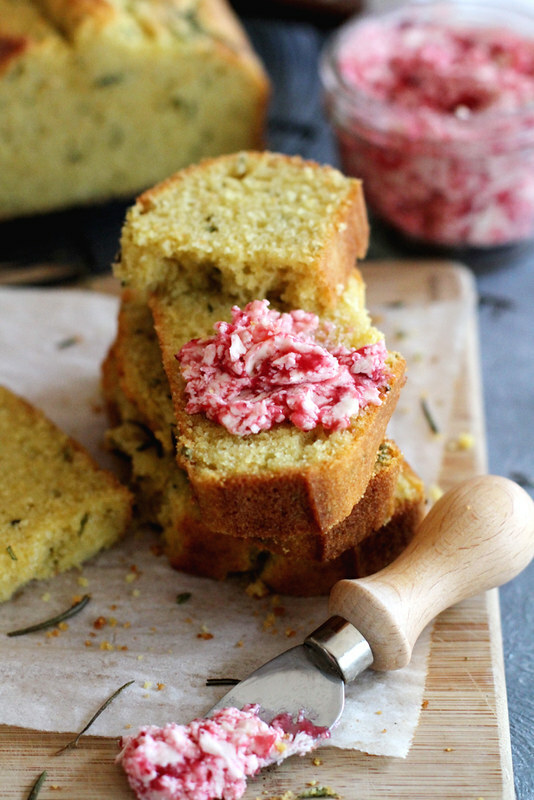 Love all the olive oil/rosemary goodness going on here, especially topped with that festive butter! mmm. Oh man, it’s the WORST when something you’ve pictured in your head turns out less than stellar…BUT! I’d say you redeemed yourself with this! That lingonberry butter! I want to slather it on everything! Happy Tuesday indeed! Yay for it being one more day ’til Christmas! I almost can’t believe it but Alex and I managed to get 100% of our shopping and wrapping done in THREE DAYS. Totally insane, I know, but we did it! Haha. Um girllll this quickbread is the bomb-diggity. I adore that lingonberry butter and I want to slather it all over everything. Pinning! Stephanie, this looks so lovely, especially with that rosemary on top and that bright lingonberry jam – beautiful! Ugh, why do the recipe fails always happen when you’re already behind??? But really this is by no means a fail because I think I’d prefer this gorgeous bread and butter over plain ol’ baked brie any day. Seriously! That butter looks amazing! Gorgeous loaf and that lingonberry butter sounds like the best ever! 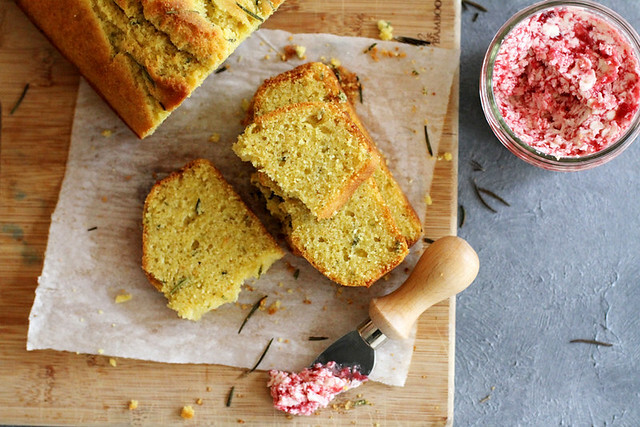 Absolutely love this cornmeal loaf! 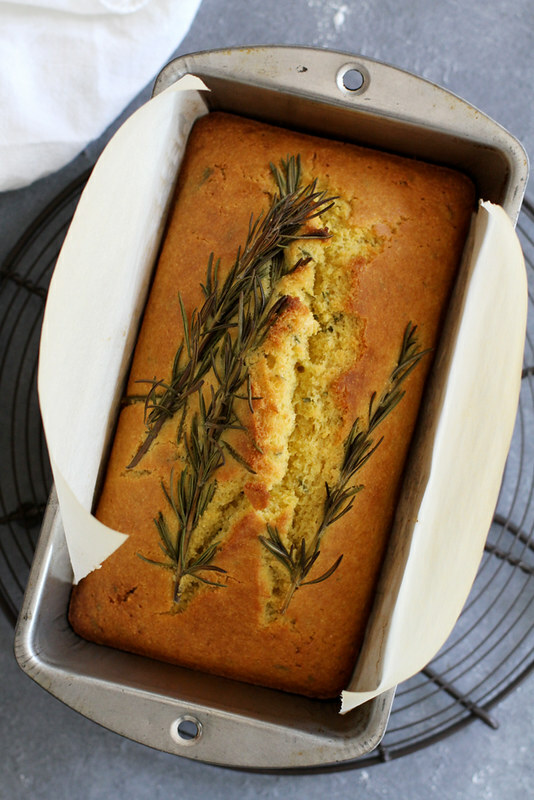 I’ve been obsessed with rosemary lately and I am trying to introduce more cornmeal as a substitute for normal flour, so I really like thsis idea. And that lingonberry butter sounds amazing! What a beautiful loaf! I am always looking for new ways to use the lingonberries that I pick up at Ikea. They are so yummy! Will I need to sift the flour beforehand? Kristy — Nope! Whisking the dry ingredients together acts as a way to sift the ingredients before mixing the batter. I’m hoping to make this loaf a few days beforehand. Would you recommend that or should I do it on the day of? Kristy — You can definitely make it one or two days before! Made 2 loaves and a double batch of the butter this Christmas. Wonderful recipe! So beautiful and moist. Spot on flavor combination. Didn’t put the whole sprigs on even though that looks so pretty, the batter was very fragrant without so I didn’t want to overwhelm with more rosemary. Thanks for the keeper of a recipe! The olive oil was something new for me in cornbread and made it so moist and uniquely flavorful.